The winter months are generally a dead period in terms of baseball news aside from the occasional flurry of activity here and there. One thing, however, that a lot of baseball fans follow very closely this time of year is the annual Baseball Hall of Fame vote. Each year the Baseball Writers Association of America votes on the recently retired players that are eligible for election into the Hall of Fame and on January 18, 2017, the Class of 2017 that will be honored this July in Cooperstown will be unveiled. There are definitely some worthy candidates and some intriguing ones as well that we will be digging into in the future here at the Blog. (Stay tuned!) 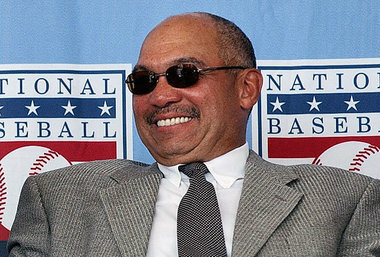 January 5 holds some special significance for the Yankees though because it was on this day in 1993 that Reggie Jackson was elected to the Hall of Fame. Reggie Jackson played for 21 seasons for the A’s, Angels, Yankees and Orioles franchises and while the majority of his time was spent elsewhere, he made the most of his time in the Bronx and cemented his legacy as an all-time Yankee. Jackson started and played the majority of his career with the A’s and that is where his postseason legend was born, helping the A’s win three consecutive World Series championships from 1972 through 1974 and earning the World Series MVP award in 1973. Following a stop in Baltimore, Jackson made his way to the Bronx ahead of the 1977 season, signing a five year contract. Jackson only spent those five years in New York but he made the most of it, helping the Yankees to back to back World Series wins in 1977 and 1978. While they enjoyed tremendous success on the field, things didn’t always function that well off the field and in the clubhouse. Jackson was at the center of numerous controversies with teammates such as Thurman Munson, manager Billy Martin and even team owner George Steinbrenner. All of these incidents earned the team the nickname “The Bronx Zoo” and Jackson an additional nickname “The straw that stirs the drink”. Despite all of the distractions, Jackson was a star with the Yankees, hitting 144 home runs and knocking in 461 runs while putting up a .281 batting average over his five years with the team according to Baseball Reference. He was a force both off the field and on it and it led to some iconic moments in Yankees history. Despite the impressive numbers that he posted year after year it was in the postseason that Jackson delivered his signature performances. In 77 career postseason games, Jackson owns a .278 batting average with 18 home runs and 48 RBI with several of these home runs coming in key moments. It was during the 1977 World Series that Jackson truly earned his nickname of “Mr. October” hitting three home runs in game six against the Dodgers. With Jackson’s last at bat of gave five being a home run as well, his game six performance made it homers in four consecutive World Series at bats. Over the course of that game, Jackson hit three home runs on three swings, with the last one being a towering shot into the black seats in dead center field at the old Yankee Stadium. This is Jackson’s signature Yankee moment and one of the most memorable moments in postseason history. For the series, Jackson batted .450 with five home runs and eight RBI and earned World Series MVP honors as well. Reggie Jackson had a whirlwind 21 year career that saw him achieve great and memorable things on some of the sports’ biggest stages. He earned his nickname of “Mr. October” because he delivered time and time again when the lights were the brightest, earning two World Series MVP awards and posting a .357 career World Series batting average. Although he didn’t spend a lot of time with the Yankees, Reggie made his presence felt every day he was here and helped the Yankees reach the top of the sport in consecutive seasons. It is because of these legendary accomplishments that Reggie entered the Hall with a Yankee cap on his plaque and was immortalized in Monument Park as well. On January 5, 1993, he was elected to the Baseball Hall of Fame with over 93 percent of the vote.